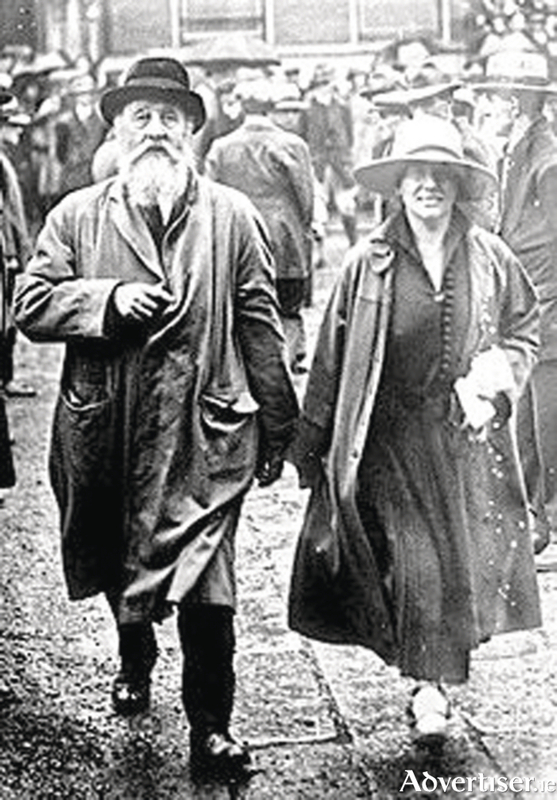 George Noble Plunkett and his wife Josephine (Cranny), coming from a public meeting. George was sworn into the Irish Republican Brotherhood by his son Joseph, just days before the Rising. In an attempt to bring some normality into their lives following the traumatic years of the War of Independence, and the Civil War, Professor Tom Dillon, and his wife Geraldine (nee Plunkett ), moved their five children to Dangan House, about three miles north of Galway town, close to the River Corrib. It is now a flourishing garden nursery, run by the busy Cunningham family and staff, but in the late 1920s it was a rambling two-storeyed manor house with shallow steps leading to a wide front door. Their father bought a cow, and chickens ran wild in the yard. In many ways it was an ideal home to bring up a lively young family, but understandably the terrors and the residue of those early years still bore heavily on the children. Politics was still a dominant player in their lives. Eilís suffered most. Born in 1920 she still had nightmares of solders bursting into their home, and ransacking the rooms. She still feared that her mother would again be arrested, taken away in a truck, and shot, like their neighbour, in their previous home at Sea Road, Fr Michael Griffin. ‘It would be foolish to put one’s trust in parents who might be dragged away, or go ‘on the run’ at any moment’, she later recalled in her autobiography, Inside Ireland, published in 1982, 12 years before her own death. Both Eilís’ parents played active parts in the troubles, and practically all of her mother’s family, the Plunketts, fought and suffered for a free Ireland. Geraldine’s much loved brother Joseph Plunkett, 28 years of age, the youngest signatory of the proclamation of the Republic, was executed on May 4 1916. His story must have been told and retold within the family. Geraldine’s father George Noble Plunkett, came from a wealthy Protestant family. He was educated in France, as well as Clongowe’s Wood College, and was a refined gentleman, who belonged to the best Dublin clubs. He was created a papal count by Pope Leo XIII for donating money and property to the Sisters of the Little Company of Mary. He was curator of the National Museum up to 1916, when he devoted his life to the struggle for Irish freedom. He became interested in the the growing nationalist movement which had attracted his three sons, Joseph, George and Jack. At least two of his daughters, Philmena and Fiona, were also involved in preparations for the coming struggle. Joseph swore his father into the Irish Republican Brotherhood just days before the Rising. Joseph, however, was a huge cause of concern for his family. That fateful spring, he had suffered a serious breakdown in health. He underwent surgery on tubercular glands in his neck. Yet he still managed to attend all the relevant meetings prior to the revolution, arriving at the GPO on Easter Monday in full uniform to take his place with Pearse and the others. After the surrender he was courtmartialled and sentenced to death along with George and Jack. The latter two, however, had their sentences commuted to 10 years penal servitude. On the evening of May 3, hours before his execution, Joseph married Grace Gifford, a cartoonist and a republican, in the Kilmainham jail chapel. Separated immediately afterwards, the couple were later allowed a brief farewell before Joseph was led out to be shot. *Joseph’s deep spirituality, and the pathos of his last hours, fuelled public sympathy that would spread outrage at the continuous executions, and lead to war. School, however, offered some escape from the endless stories and the political activities of the elderly George Noble Plunkett. ** All the children loved their junior school teacher Mamó. ‘She taught us to spell in two languages, singing the names of the letters first, like a cantor, then having us join in, repeating the sounds over and over until they were part of our anatomy. In the same way we rhythmically sang out addition and subtraction and multiplication tables.’ They sang songs too. And in their places were two wooden pegs. ’Teddy, my boy, is it true?Is it true? Och, Teddy my darling, sure that’s not you? NOTES: * The wedding was not popular with the Plunkett family. Geraldine maintained that Grace was pregnant at the time of the marriage, but miscarried some weeks later while living at the Plunkett ‘Larkfield’ home, which had also been used as a store for guns and ammunition. Later Grace instigated legal proceedings against the Plunkett family to secure a share in her late husband’s estate. Geraldine described Grace as ‘a loner and often very difficult’ (Dictionary of Irish Biography ). ** George Noble Plunkett, who was 65 years of age when the Easter Rising began, went on to play an active part in the new Ireland. He was elected for Sinn Féin to the Dáil for Leitrim-Roscommonn, 1918-1927; he became Ceann Comhairle of Dáil Éireann, and finally Minister for Foreign Affairs. He died in 1948, aged 96. And yes he was initially expelled from all the best Dublin clubs for his part, and his family’s part, in the War of Independence. Later he was reinstated, and welcomed!